When you come to think about it, being a Bounty Hunter is not such a strange profession after all. Like other people in the ‘justice game’, the Bounty Hunter is there to keep the peace, and maintain a level of order among the planes of the Wild West. And do you know whom partakes in this profession? Director: John Sturges; and Actors: Clint Eastwood, Robert Duvall, John Saxon, and Don Stroud – especially for 88 minutes in the year 1972. I am sorry to say that soiled prairie tracker, Joe Kidd (Clint Eastwood), is having a very bad day. For a start, due to an act of insobriety, Joe has been sentenced to spend ten days in jail at a court of law. Next, whilst his sentence is being posed, Mexican revolutionary, Luis Chama (John Saxon) storms the court-house, and demands penance for the mistreatment of his people. Plus, on top of that, this strained turn of events prompts Joe and Charma get into a right kerfuffle - resulting in Joe to schlep back into jail - and Charma to ride off into the distance. Oh! And if all that wasn't weird enough, weirder still, the very next say, Joe is contacted by wealthy landowner, Frank Harlan (Robert Duvall) to help him track down Charma, due to a bounty places upon his revolutionary head. Still, do you think that Joe will accept this offer with open arms? As Frank did pay for him to get out of jail. No - not straight away - as Joe does not really want to get involved. However, later that same day, when Joe discovers that Charma has attacked his stable-hand - that's what prompts him to accepts Franks offer - and they ride off over the planes to ‘get their man’. Though, you have to remember that tracking down Charma is by no means an easy feet. You see, for them to be able to accomplish this tactical task, they: (1) Shoot down a crowd of Charmas compatriots when they approach them on the planes. (2) Intimidate Charmas female companion, Helen, when they come across her domicile. And (3) Come unstuck when they finally track Charma down, only to find out that he is hiding somewhere within a mountain-side that looms over a rustic lo-cal. Now to rectify this situation, Frank and his men kidnaps the residence of this lo-cal, and threatens Chama in the distance, that if he does not come out into the open, he will systematically shoot everyone in the vicinity within a twenty-four hour time span. Quietly, Joe isn’t too happy when he hears this declaration, and after a nights sleep, instigates a plan that causes havoc amongst Frank and his men – before delving into the mountain-side and suggesting to Chama another plan. So what is this plan? And will it be able to provide a reasonable outcome for all involved? Hmm? Maybe – depending on your perspective that is. As it is long – drawn out – and suspenseful plan – involving a lot of shooting – a lot of riding – but ultimately a lot of luck, CHOO-CHOO! First off, let me just say that 'Joe Kidd' was an Elmore Leonard novel which has been adapted into filmic form - just like 'Jackie Brown', 'Get Shorty', and 'Out Of Sight'. So from this alone, you know what type of things to expect, right? A lot of voice-over narration – parallel plot points’ – and a twist at the end – correct? Nope. Plus, in addition this, the Director of this film, John Sturges, the man who brought us 'The Magnificent Seven', 'The Great Escape', and 'The Gunfight at the OK Coral'. So from this alone – you should also get a lot of dramatic tension – a lot of pathos – and a lot of coy remark’s too – correct? Nope again. Oh! And let’s not forget about Clint Eastwood, as... err... I think that I have made my point by now – don’t you? And please don’t say ‘nope’. OK, I am sure that you can gather from what I have said so far, that ‘Joe Kidd’ is somewhat unpredictable movie. But is that a good thing or a bad thing? Hmm? Depends on what floats your boat I suppose. 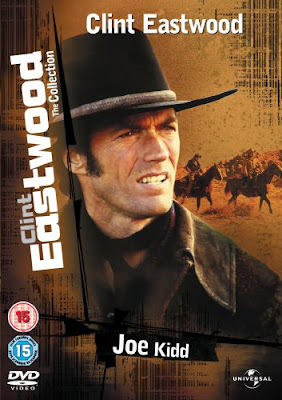 Personally speaking, it was a ‘so-so’ film – Clint’s in it – and he does his best to make this film enjoyable. However, enjoyable is a relative term where this film is concerned. Its just a bit too simple in approach overall, with all the actors – whom are great by the way – restrained by the linier storyline, and the rigid structure that this film brings along with it. In many ways it is a ‘paint it by numbers’ kind of a film, relayed as: (1) Set up the pretext – Clint and Saxon in the courthouse. (2) Set up the protagonist – Duval comes into town with his men, and gages Clint as an ally. (3) Track down the protagonist – Clint and co rides along the Wild West. (4) Instigate the conclusion – kidnap a small village. And (5) Conclude – yawn, can I sleep now? Now please understand that I am a big Clint Eastwood fan, and I do like everything he does – even if she starred in a poxy soap commercial. It’s just that I found this movie to be a bit mannered in places, and did not really float my boat contextually. Still, to juxtapose this stance, there are a number of things about this film, which I did like. Firstly, as I have said before, all the actors do put on a show - and are able to splash a bit of charm onto the proceedings to boot. Secondly, it is a very pretty film - with some scenes picture perfect to put on anybody’s computer screen. Thirdly, there is a message in this film - one pertaining to land-rights, and the unjust of the few to the committal of the many. And fourthly, Lalo Schifrin's musical score is very similar to his latter work on ‘Enter the Dragon’ - which is a good thing in my book. Overall, though, ‘Joe Kidd’ is a not bad early seventies western, and is well worth a watch if you like Clint Eastwood, Robert Duvall, John Saxon, or westerns in general. So-so movie – needs a remake.